Product prices and availability are accurate as of 2019-04-25 00:31:38 UTC and are subject to change. Any price and availability information displayed on http://www.amazon.com/ at the time of purchase will apply to the purchase of this product. Haier HVTM12DABB 12 Bottle Dual Zone Freestanding Wine Cooler - glass door / black trim. The Haier Dual Zone 12 Bottle Wine Cooler is perfect for storing your fine wine collection. It is big enough to hold wine for all of your guests, but space conscious enough to be out of the way. Features ultra-quiet, highly efficient thermoelectric cooling, perfect for both red and white wines. This translates to less noise, less vibrations, and a safe place to store your favorite wines until you are ready to enjoy them. 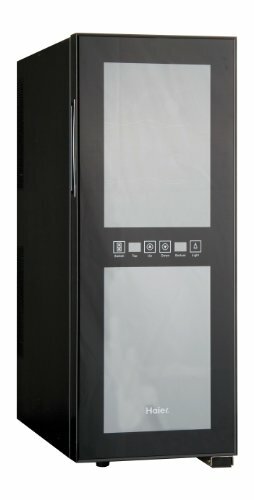 This compact wine cooler comes with 4 chrome wire storage racks for up to 12 bottles of wine, a double insulated amber tinted glass door and an adjustable thermostat providing easy touch screen temperature control for each compartment (Upper: 52-64 degrees Fahrenheit/Lower: 45-54 degrees Fahrenheit). The HVTM12DABB Haier wine cooler features a black finish and soft interior lighting that puts your collection on display for a sophisticated look. Wine cooler dimensions: (20-inch diameter, 10-inch width, 24-inch height).